Editable personal website sitemap to plan your blog or personal website. Visualize the structure of your blog by editing this template using our diagram editor. Website sitemaps, aka website structure diagrams, are used to plan a web site's purpose, navigation and its overall organization. They are also used to experiment with a new website layout, test new navigation paths and to re-organize existing structures. 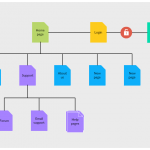 Using website sitemaps you can quickly visualize the pages in your website, future pages that needs to be added, how many steps are needed to reach a certain webpage, what are the secure pages and so much more. It's all about using the right tool and adding the right information to your sitemap. 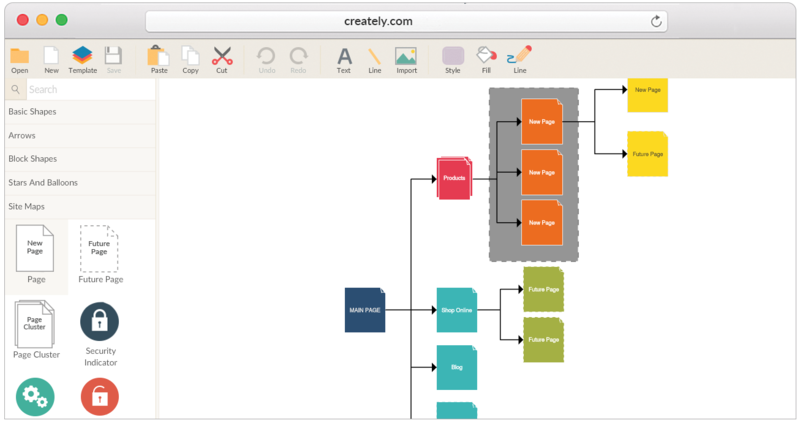 Creately has a robust set of sitemap shapes to easily create different types of website structure diagrams. Current pages, secure pages, page collection, future pages and so much more are available in our library. We also provide you with professionally designed sitemap templates which you can quickly edit and visualize your own website sitemap. Our object linking feature enables you to directly link to the live page or the wire-frame of the page making it super easy to manage everything from one place. Plus you can use our tool to create wireframes, flowcharts, org charts, mind maps and so much more. It's like one tool to draw them all.